Clearing the output gas is particularly important when the gas is intended for use in internal combustion engines or gas turbines. The primary rough purification from ash is done in cyclone battery. In cyclones the gas enters immediately after the reactor at a temperature of 300 to 500 C0. That prevents condensation of tars and water housings in cyclones. After cyclonic battery the gas is purified by ash up to 80%. In cyclones the gas is cooled partly to 250-300 C0, allowing submission to the electrostatic filter. Electrostatic filter is used for dry purification of the gas from the ashes. In electrostatic filter gas is purified to 99.9% from ash. 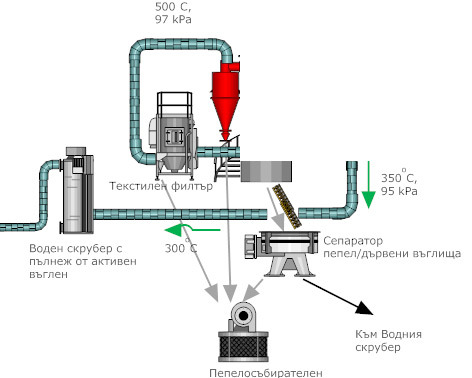 High purification of solid particles in electrostatic allows in the gas chamber aaditional catalytic steam reforming of the tar. Our installation does not use an external power source which results in increased overall efficiency of the system. In the catalytic chamber of steam reforming, the tar interacts with water vapor generated in the gasification process, enriching the resulting gas thus increasing its calorific value per unit volume, while purifiing the gas from tar to 99%.